Description: This volume is a hybrid collection of essays which explore current critical discourses on possible future developments in cybernetics. 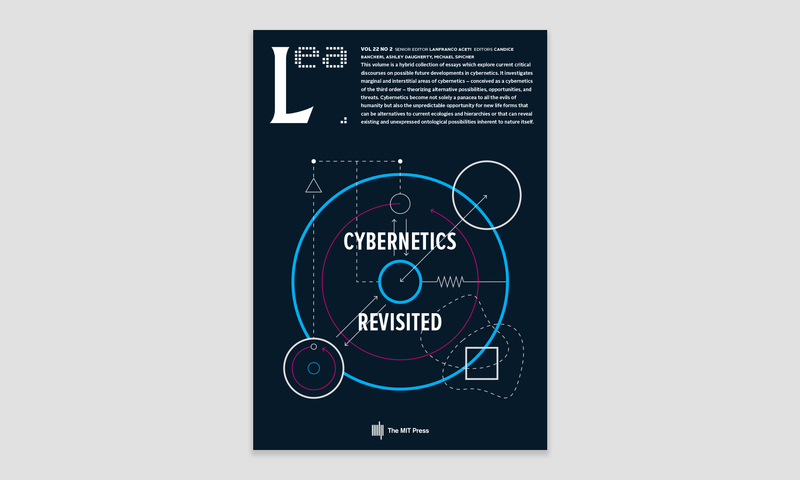 It investigates marginal and interstitial areas of cybernetics—conceived as a cybernetics of the third order—theorizing alternative possibilities, opportunities, and threats. Cybernetics become not solely a panacea to all the evils of humanity but also the unpredictable opportunity for new life forms that can be alternatives to current ecologies and hierarchies or that can reveal existing and unexpressed ontological possibilities inherent to nature itself. Reference this volume: Aceti, Lanfranco, et al., eds. Cybernetics Revisited. Cambridge, MA: LEA / MIT Press, 2019. Acknowledgements: The Leonardo Electronic Almanac is a collaborative effort supported by MIT Press, Leonardo/ISAST, Goldsmiths, KHM, New York University (Steinhardt School of Culture, Education and Human Development), OCR (Operational and Curatorial Research), and CAC (Contemporary Arts and Cultures) at MIT. The aim of this paper is to connect the history of art to its future via a political fantasy. I am interested in the so-called Project Sigma launched in the early 1960s by Alexander Trocchi. Trocchi thought of revolution as an outflanking maneuver and of sigma as a parallel world that would escape from the grip of the dead hand of modernity. Sigma was envisaged as primarily an art collective or “spontaneous university,” but Trocchi was not specific about the art that it would include. I want to bring sigma back to life by re-specifying it around works that stage an ontology of becoming. I discuss the potential of ontological thought to create bonds between otherwise disparate classes of artworks and, importantly, beyond the art world. I argue that ontology makes a difference politically: how we understand the world and how we act in it are systematically bound together. In this paper, I argue that a prosthetic aesthetic instigated by experimental art practices operates with a ‘second nature’—in between science and art. Drawing on theories from Dewey, Edelman, and examples from Da Vinci, Brancusi, Man Ray, Dalí, and Stelarc, I am calling for an experience-based analysis of experimental practices operating between body and technology. Rather than falling into the category of science fiction or horror cinema as recent critique from post-human studies would have it, these practices are pointing toward a genealogy of prosthetic experience in art, which is performing a complex redesign of (the idea and representation of) technology and the body. 0h!m1gas is an artistic research and audiovisual installation that approaches the self-organization in ants as a cybernetic system with emergent acoustic manifestations. Designed as an artificial ecology, 0h!m1gas investigates the complexity of leaf-cutter ants by amplifying their vibratory signals, known as stridulations, while doing a motion tracking of their social labor. By means of contact microphones, turntables, and video cameras interfaced with a computer vision program in Max Jitter, the life of the ant colony emerges as a complex soundscape of scratching and stridulation effects. This essay describes the design of a hybrid physical/digital system for claiming ownership of territory. By combining digital and natural affordances for staking ownership, I provide a new remediation featuring greater embodiment than is available in existing services such as Foursquare. This paper illustrates how the interface between human and the interactive audiovisual space affects the dancer’s choreography in two projects: Shin’m (S1) and Shin’m 2.0 (S2). The interface of S1 is wearable like a jacket and wired to the ceiling with elastic tubes. The S2 human-space interface has no “physical” presence but invisible layers of ranges and contours detected by the Kinect sensor. The S1 interface offered the dancer a tangible attachment but limited mobility. The S2 interface allowed the dancer to explore full range of speeds and levels while its loss of tangibility, at first, was challenging for building a palpable and instant connection. We discuss Biopoiesis, a cybernetic art project that explores the relationships between structure, matter, and self-organization. Based on the work of cyberneticist Gordon Pask, the project features the construction of simple computational devices that harness an electrochemical reaction. We discuss the design and construction of the system and explore the relevance of Pask’s electrochemical work to the arts. We also put forth the notion of a “philosophy of open-ended ambiguity,” embedded within this work and discuss its resonance with the arts. This paper looks at the technical and compositional methodologies used in the realization of V’Oct(Ritual) (2011), with particular reference to the choices made in the mapping of sensor elements in various spatialization functions. Kinaesonics  will be discussed in relation to the coding of real-time one-to-one mapping of sound to gesture and its expression in terms of hardware and software design. Within everyday urban experience the methodology of field recording as an artistic practice does not require the artist to directly participate in the mediation process of sound art. However, it can be argued that if the artist does not remain a mere listener/recordist but instead registers his or her presence in the phenomenological development of the artwork by intervening as ‘self,’ the outcome can transcend mere impression of the urban space and can become a critical reflection of the dynamic relationship between the artist and the city. Working on this assumption, the personal context of the artist needs to be examined in order to understand how he or she can intervene in and engage with the process of the artwork. This paper develops the argument from a practice-based approach, drawing experiential accounts of an ongoing sonic interaction-based art project, The Well Tempered City.